[AG-TECH] AG Seminar: Fri 16 Nov 2pm, J. Dykes "Interesting? Aesthetic? Useful? 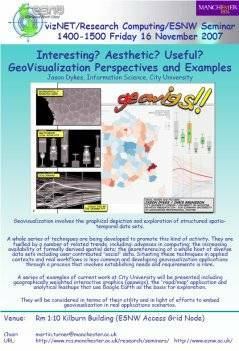 GeoVisualization Perspectives and Examples"
Next message: [AG-TECH] RE: AG Seminar: Fri 16 Nov 2pm, J. Dykes "Interesting? Aesthetic? Useful? GeoVisualization Perspectives and Examples"